Most of us only hear about volcanoes when a major eruption takes place and the images are shown in newspapers and on televisions around the world. Brad Lewis’ awareness of active volcanoes is a little different: he lives on one. In fact Brad lives on one of the most active volcanoes on earth, Kilauea, on the Big Island of Hawaii. Brad’s link with Hawaii started some twenty years ago whilst on vacation from Alaska, where he worked in geology and archaeology. It was a turning point in his life. Although he still maintains homes in Alaska, and also Utah where he grew up, Kilauea has become the creative focus and inspiration for his work. “The Big Island grabbed me. It was mesmerizing and seductive. Once I saw Kilauea, the world’s most active volcano, and absorbed what was happening there, I better understood the dynamic creation of our planet.” The reason that it is at all possible to live beside such an active volcano is that the lava on Kilauea is basaltic magma, a very fluid lava which tends to flow long distances, rather than erupting in catastrophic explosions. The result is the formation of the huge, gently angled shield volcanoes of Hawaii, and the relatively benign nature of Kilauea. I asked Brad whether he has any photographic ambitions to fulfill, having lived and worked on Hawaii for so many years. Has he seen it all? “In working with an active volcano, change is a constant, and variety continual. 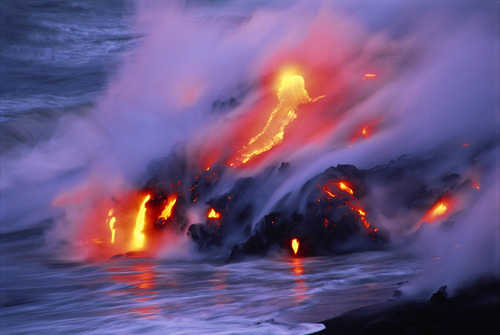 Even though I have seen lava enter the ocean a thousand times, it is always different, so my opportunity to make a stunning image is always there. For instance, I have seen rivers of lava come down the mountain hundreds of times. Two months ago, I hiked for several hours to a massive a'a lava flow taking out a forest on its way to the ocean. The images I captured from this event are totally different than anything I ever created before. So each time I go onto the volcano, I look for the creative essence that awaits me. It is often elusive. I travel with quiet mind and open heart”. West of Kilauea lies the huge shield volcano Mauna Loa, the largest single geological structure on earth, with a colossal volume of forty thousand cubic kilometers. It towers nearly 30,000 feet from its base on the floor of the Pacific Ocean to a height of 13,677 feet above sea level. When Mauna Loa erupts, rivers of molten lava flow down its slopes. “One thing I look forward to fulfilling, is capturing the power and beauty of a Mauna Loa eruption. It is nearly 20 years overdue, but it will come. I just hope I am not off on some remote adventure in Alaska when it happens”. Brad’s photography clearly shows the aesthetic sensitivity of an artist. Summarising the essence of his work, he writes on his website: “I utilize movement, light, and texture of volcanic activity to open human emotions to the pulse of the Earth. I have chosen Kilauea Volcano on the island of Hawaii as my primary subject. Nowhere else on Earth is creation happening on a continual basis at such a rapid rate. I find it crucial that there exist visual reminders that the Earth is alive and fulfilling an agenda of it's own. It is my desire to continue generating positive inspiration by focusing on photography that captures this essence of creation, beauty, and raw power”. His thorough scientific understanding of the processes taking place within Kilauea compliments his intuitive feeling for the volcano. “I have a lifetime of work ahead of me in regard to Kilauea Volcano. The dynamics of the eruption shift continually, so there is always something to record or be aware of. I study the science of the volcano so that I can be prepared for new events. It is important to be there when major events unfold. I have never been bored with photographing this volcano. The land grows before my eyes. The light is bright with creation. The movement is fluid and exciting. And I can share it all with the world. Humans need to see and feel the creation that is happening here. I can provide that through my photography”. Amongst the most spectacular natural phenomena to be seen on earth, photographing active volcanoes at close quarters appears to the outsider to be fraught with danger. I asked Brad if he has ever found himself in mortal danger and how he handles the potential and actual risks of his work. “This is a common question. It appears very dangerous. This is a foreign world to most people. I am so familiar with Kilauea Volcano, that it feels like a dear old friend. We have shared so much together. There are many dangers associated with being on an active volcano. I rarely have felt that I am in harms way, due to common sense and traveling by intuition. I always pay attention to that little voice deep inside. When it says "leave", I leave. No questions asked. I do not take chances, to get the image. But this is all from my perspective. An outsider may well think that I could not be in a more dangerous situation, with lava exploding around me, but by properly reading the conditions and understanding the dynamics of what is happening around me, I can come away with imagery that is uncommon and inspirational”. Brad sometimes arranges to be dropped near the active vents 3000 to 4000 feet up the mountain, the source of the magma flowing downhill to the ocean. He takes several days food and water and sets up camp in a position where the dangers of toxic fumes are minimal. “I choose sites where I can always have an escape plan if I have to move fast”. 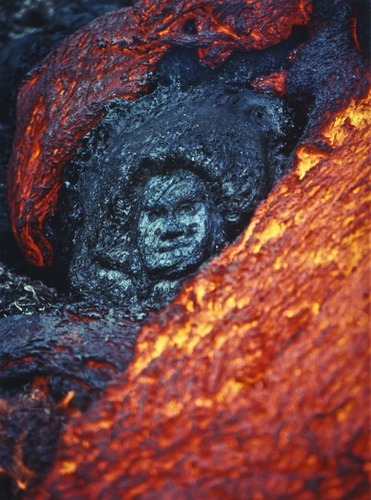 The Hawaiian Islands were created by the same processes to be seen today on Kilauea. The beautiful, unpredictable, red-headed goddess of volcanoes, Madame Pele, is still revered in Hawaii, and has the power both to create and to destroy. “People who live here accept volcanoes as part of their daily lives. We watched the entire town of Kalapana wiped out by a tongue of lava just one mile from where we live. We have seen houses burn down, and my favorite surf spot was covered by lava. But we understand the volcano and know it’s not going to kill us. It may take our home, but we can walk away”.